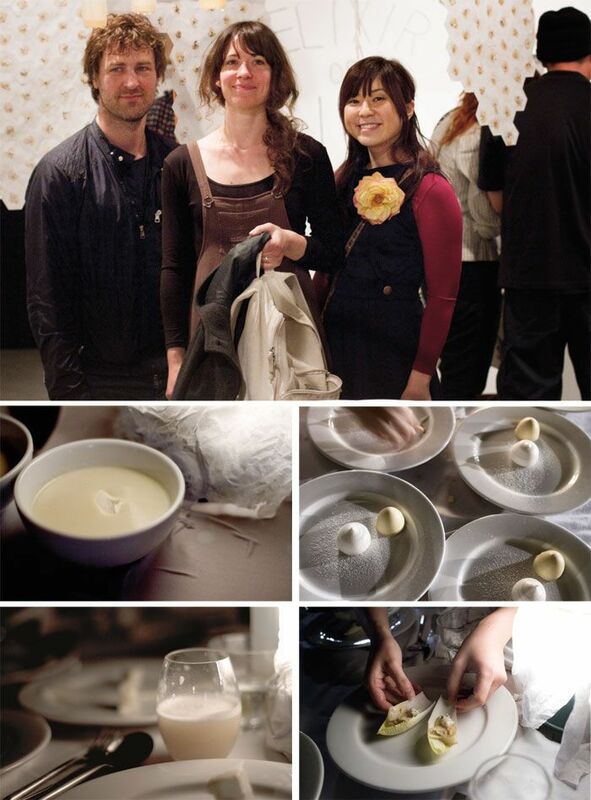 Thought For Food founders Randall Stewell, Yvonne Mouser and Lisa Mishima at their installation spun honey. White on White created for Le DÃner Ã San Francisco. San Francisco-based "eating experience design" collective Thought For Food aims to change the way you think about eating. "It all started with trying to find a way to integrate robots into an eating experience," says one of TFF's founders, Lisa Mishima, "which led us to look at the range of the mechanics of eating from hands to simple tools." Until the day comes when we are being fed by robots, Thought For Food is using a broad range of design approaches to produce gallery installations, immersive dining experiences and products, recasting people's ideas about eating through a conceptual visual component, as well as amazing food. Mishima founded TFF with fellow artists and designers Randall Stowell and Yvonne Mouser. Mouser explains that the trio's day jobs help them to create innovative projects like the hauntingly beautiful installation Spun HoneyÂ­, in a community center in the Mission, where they suspended beeswax pots filled with local honey that drizzled out onto honeycomb tarts when guests turned a crank. Participants then ate the tarts and took home seed packets to plant--simulating a life cycle in the ecosystem. "We are all artists and designers, so naturally in our collaborations we approach food and eating with the same processes and conceptual thinking that we would any other creative challenge," says Mouser. "The results are projects that play at the intersections of food, art and design." 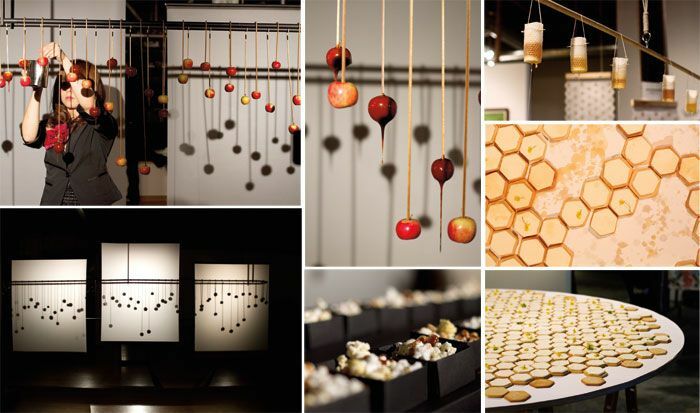 24 Frames per Second created for an autofuss party where caramel apples dripping on popcorn served as decoration and treats; (right) spun honey installation. They also aren't afraid to have a little fun. At a recent underground movie night they made "body shots" -- watermelon pieces soaked in cherry concentrate to resemble bloody flesh and dropped in shots of vodka -- to complement a screening of the B movie Piranha. And they give a whole new meaning to DIY with projects like Hands On -- a raucous event where all participants were separated into teams and tasked with making Caesar salad, homemade pasta with pesto sauce and tiramisu, using only their hands. It was a delicious mess.